We welcome all traders and new traders to an exciting 2018! Financial Traders are back, and liquidity should be back to normality this week. The key word for this year is Strategy. A choppy year for the Currency markets but the Stock Markets just seem to be unstoppable. The big question is how long can this last. Personally, I do not want to go against the trend but with the Dow Jones climbing to new highs and smashing through the major resistance of 25000. Did you study your trading statement from last year and take time to understand where your weakness lies? If the answer to all the above is NO, then STOP. At platinum, we will do this for you and take the time to re-strategize your trading plan. UNSUSTAINABLE is my view on the marketplaces we had major financial crashes in 1929 and 2000 and 2008 as a financial analyst and financial trader myself I am seeing a major crash in and over the next 365 days. I want to prepare you for this crash as this could help you in advance not only to prepare for the markets but how to actually benefit from this opportunity. The Markets are breaking Record levels as I write this particular book and the whole marketplace is in a state of bliss. Overvaluation is an understatement and I foresee one of the biggest crashes and financial system collapses that the world will ever see. The big question is how long can this carry on for and is this the year of 2007 i.e. the pre-crash year. 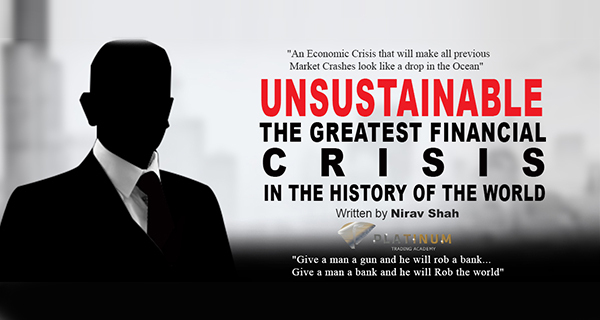 In this particular book, I shall be going through some very important concepts of the market crash that I am expecting within the next 365 days and the core reasons for this crash. Please bear in mind that there are no fixed dates for this crash but when the glass if full it will tip over. Remember Markets tend to go down a lot faster than they go up and if you have positioned yourself correctly in the marketplace you could make a decent fortune. When the crisis hit in 2008 and 2009 the Federal Reserve pumped out trillions into the bailouts to ensure that the markets came back to some kind of stability and all of this was to essentially prop up the dollar system. Having traded the Financial Markets and several crashes in the last 15 years the first constituent as a TRADER is that I have survived. If only the hardworking individuals could see what I am seeing and that is various bubbles and the biggest bubble of them all is the DOLLAR BUBBLE. I have been following Warren Buffet since my early 20’s and one stock I follow very closely is Berkshire Hathaway which is the signature point of Warren Buffet. 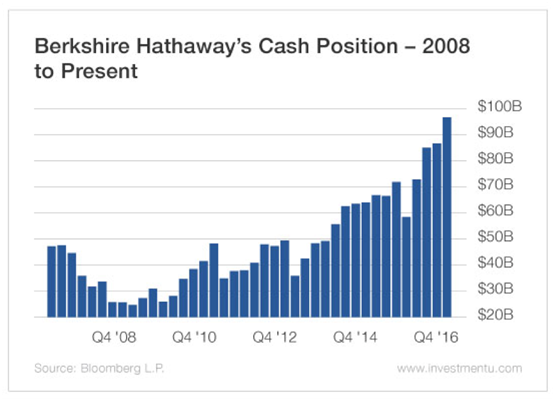 From a contextual point of view at the time of writing this article Berkshire Hathaway’s cash holding has doubled since 2008 and sits more than a $100 billion. In 1929, the Federal Reserve raised interest rates several times in an attempt to cool the overheated economy and stock market. By October, a powerful bear market had commenced. On Thursday, October 24th, 1929, a spate of panic selling occurred as Stock Market Crash of 1929 Newspaperinvestors began to realize that the stock boom was actually an over-inflated speculative bubble. Margin investors were being decimated as large numbers of stock investors tried to liquidate their shares to no avail. Millionaire margin investors went bankrupt almost instantly when the stock market crashed on October 28th and 29th. During November of 1929, the Dow sank from 400 to 145. In just three days, over $5 billion worth of market capitalization had been erased from stocks that were trading on the New York Stock Exchange. By the end of the 1929 stock market crash, a staggering $16 billion worth of market capitalization had been lost from NYSE stocks. To make matters worse, many banks had invested their deposits in the stock market, causing these banks to lose their depositors’ savings as stocks plunged. Bank runs soon occurred when bank patrons tried to withdraw their savings from banks all at the same time. Major banks and brokerage firms became insolvent, adding more fuel to the stock market crash. The financial system was in shambles. Even bank patrons who had not invested in shares became broke as $140 billion of depositor money disappeared and 10,000 banks failed. Sixteen years ago, the tech bubble crashed. 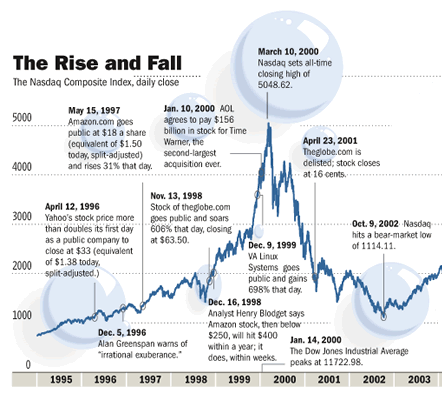 The NASDAQ fell from a high of 5,132 in March 2000 to just 1,470 a few months later, as giddy investors suddenly sobered up after figuring out that web businesses with little or no revenue were fundamentally worthless. Companies worth billions when they IPO’d went to zero. Good companies were dragged down with them: Cisco lost 86% of its market cap. Amazon stock fell from $107 to just $7. A global recession kicked in within a year. Few who lived through it will forget it. The 2000 crash remains one of the defining features of modern economic life. The invention of the Internet led to one of the biggest economic booms in history. The history of this global network of computers traces back to early research activities in the 1960s, but it wasn’t until the creation of the World Wide Web in the 1990s that large-scale adoption and commercialization started to catch on (Internet, 2012). Once it became clear to investors and speculators that the internet had created a wholly new and untapped international market, IPOs of internet companies started to follow each other in rapid succession. Sometimes the valuations of these companies were based on nothing more than just an idea on a single sheet of paper. The excitement over the commercial possibilities of the internet was so big that every idea which sounded viable could fairly easily receive millions of dollars’ worth of funding. The basic principles of investment theory with regard to understanding when a business would turn a profit, if ever, were ignored in many cases, as investors were afraid to miss out on the next big hit. They were willing to invest large sums in companies which did not have a clear business plan. This was rationalized by a so-called ‘dot-com theory’: for an internet company to survive and grow, it depended on the rapid expansion of its customer base, which in most cases meant huge initial losses. That there is some truth in this is proven by Google and Amazon, two hugely successful companies in 2012, but it took them both several years before they showed any kind of profit. Many of these new companies spent a lot of money internally as well. Because of stock option plans, the employees and executives of these companies became overnight millionaires after their IPOs, while it was not uncommon for these companies to spend a lot of money on luxurious business facilities, as confidence in this ‘new economy’ was extremely high. In 1999, there were a total of 457 IPOs in the U.S.—most of the internet and tech companies. Out of these, 117 managed to double their value within the first day of trading. Communication companies such as mobile network operators and internet service providers also started to invest a lot in network infrastructure, as they wanted to be able to grow along with the demands of the new economy. This meant many of these companies took on huge levels of debt in order to be able to invest in new network technology and to acquire wireless network licenses. Only time will tell the full story of the stock market crash of 2008, but on Monday, October 6, the stock market would start a weeklong decline in which the Dow Jones Industrial Average would fall 1,874 points or 18.1%. While the exact cause of this crash may differ from those of 1929 and 1987, they share one common element – they all began in October. During the years preceding the credit market collapse, the sub-prime mortgage industry thrived. Individuals with poor credit were given access to loans they really couldn’t afford. But as long as home prices were on the rise, these poor lending practices were simply ignored. Lenders could afford to write bad loans as long as the homeowner’s equity outpaced their desire for new debt. If borrowers were to fail to pay back their loans, lenders could always foreclose on the home, since it was an asset with ever-increasing value. The credit market’s problems began when housing prices started to fall in 2007. Homeowners frequently found themselves with underwater loans. They owed lenders more than the home was worth. When faced with these facts, homeowners no longer feared the threat of foreclosure. Even more disturbing was the fact that some families abandoned their homes; choosing to start their lives anew elsewhere rather than worry about paying off their debts. As mortgage defaults started to rise, the national economy started to falter, and fear crept into the credit markets. Despite the efforts of the Federal Reserve, the destabilization of the credit market quickly spread to the national financial system. Lenders began to fear borrowers could no longer repay their loans. Bear Stearns was the first investment bank to fall victim to this fear. Investors, as well as other financial institutions, began to worry that money borrowed by Bear Stearns would not be repaid, and they began pulling money back from Bear Stearns. On March 13, 2008, Bear Stearns advised the Federal Reserve that its liquidity position had deteriorated and that it would file for bankruptcy unless alternative sources of funds were made available. Two days later, Bear Stearns agreed to merge with JP Morgan Chase in a deal that wiped out 90% of Bear Stearns’ market value. By the year 2008, the Federal National Mortgage Association (FNMA or Fannie Mae) and the Federal Home Loan Mortgage Corporation (FHLMC or Freddie Mac) either owned or guaranteed nearly $6 trillion in mortgage loans. With a mortgage crisis in the United States, these two corporations quickly began showing signs of financial distress. On September 7, 2008, the governing authority over these two agencies, the Federal Housing Finance Agency, or FHFA, placed both Fannie Mae and Freddie Mac under their conservatorship. In addition, the U.S. Treasury Department began supplying funds to help stabilize these companies, raising the national debt ceiling by $800 billion in the process. 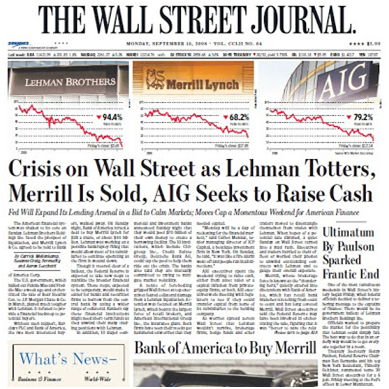 On September 14, 2008, Bank of America agreed to acquire Merrill Lynch for $50 billion, as the second wave of volatility began in the financial community. On September 15, 2008, concerns over the ability of financial institutions to cover their exposure in both the sub-prime loan market as well as credit default swaps led to further market instability. That same day, Lehman Brothers would be forced to file for Chapter 11 bankruptcy protection. On September 16, 2008, American International Group would fall victim to a liquidity crisis, as AIG’s shares lost 95% of their value and the company reported a $13.2 billion loss in just the first six months of the year. By September 22, 2008, AIG was removed from the DJIA, replaced by Kraft Foods. Although the market arguably started its crash back on October 1, 2008, the Black Week began on October 6th and lasted five trading sessions. During that week, the Dow Jones Industrial Average would fall 1,874 points or 18.1%. In that same week, the S&P 500 would fall more than 20%. After a brief uptick in mid-October, the market would begin the second decline later in that same month. On October 24th, the Dow would fall 312.30 points to 8,378.95. This was its lowest level since April 25, 2003. The S&P 500 would fall 31.24 to 876.77, its lowest level since April 11, 2003. Finally, the Nasdaq Composite would fall 51.88 points to 1,552.03, its lowest level since May 23, 2003. This year may have been record-breaking for the FTSE 100 so far – but the year is yet young, and with Brexit negotiations and Donald Trump’s presidency still to come, a lot could go wrong. 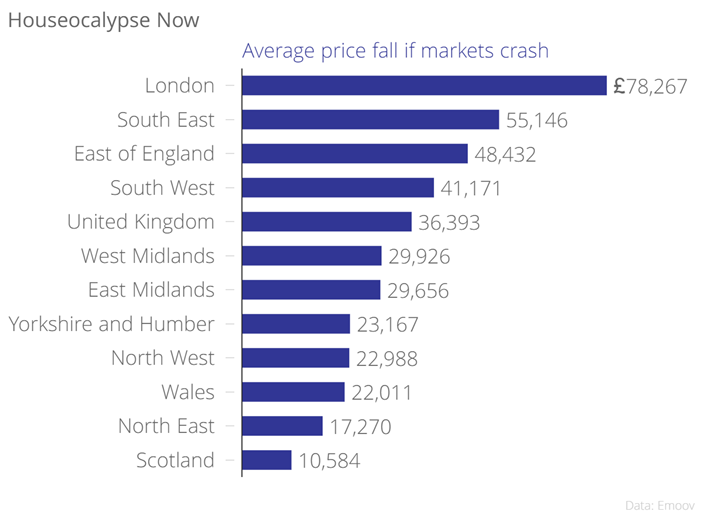 So, the online estate agent Rightmove has helpfully donned its tinfoil hat and worked out what could happen to UK house prices if there is a 2008-style market apocalypse. 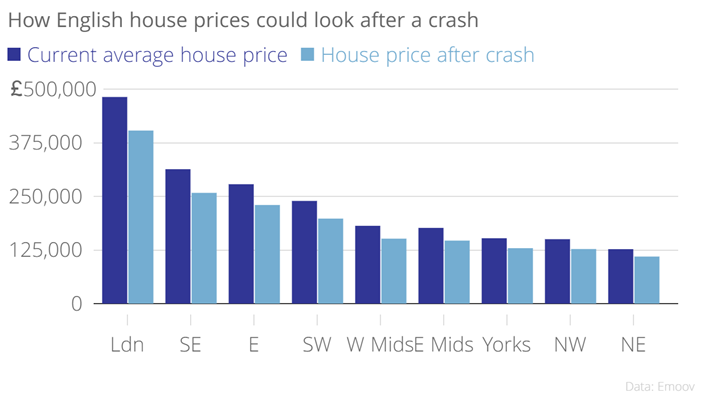 The bad news is, homes in the London could stand to lose £850 in value a week in the event of another financial crisis. The good news? Er, there is no good news. We modelled the data based on 21 months between the end of 2007 and the beginning of 2009, when the previous financial crisis was at its worst. It applied the same percentage decrease in the current average house price – and found £36,393, or 16.7 percent, could be wiped off the average UK house price. The largest decrease will take place in the South East, where house prices stand to fall 17.6 percent, or £55,146. That’s followed by the East of England, where prices fell 17.4 percent in the previous crisis – which today could be equivalent to £48,432. In the capital, meanwhile, prices fell 16.3 percent last time – which would now be equivalent to a drop in the value of £78,267. “Although the UK property market as a whole is faring very well, there are signs that the London market, particularly the prime central end, is running out of steam heading into 2017,” said Emoov chief executive Russell Quirk.